305th day of the year. There were then 60 days left in 2018. 41st day of Fall. There were 50 days left till Winter. The U.S. Military was the most fearsome fighting force the world's ever known. That we're amassing thousands at the border to "repel" desperate women and children 100s of miles away is an insult - to those in uniform, to the intelligence of the American people, and to our values. 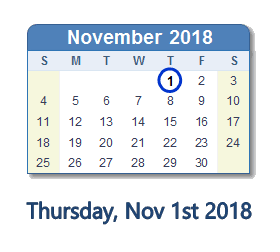 What happened on November 1st 2018?